Blog WordPress Optimization and Tutorials How to add FontAwesome.io Fonts to WordPress without any Plugin? On Crunchify, we always seek to improve page speed and as you may have seen in my last post, how we removed loading 9 highly downloaded resource on site. One of the reason we were able to do that is to use FontAwesome.io fonts on Crunchify. All social media icons on Sidebar, Header down arrow , post meta icons (, ), Social sharing buttons at the bottom of each page, etc all are font awesome fonts. I don’t have to load those icons .png or .jpg separately. It’s super simple on how to add font-awesome.io fonts to any WordPress site and we would like to share steps on how to do that. Download font-awesome.io fonts from home page. Just click on No thanks, just download load Font Awesome. 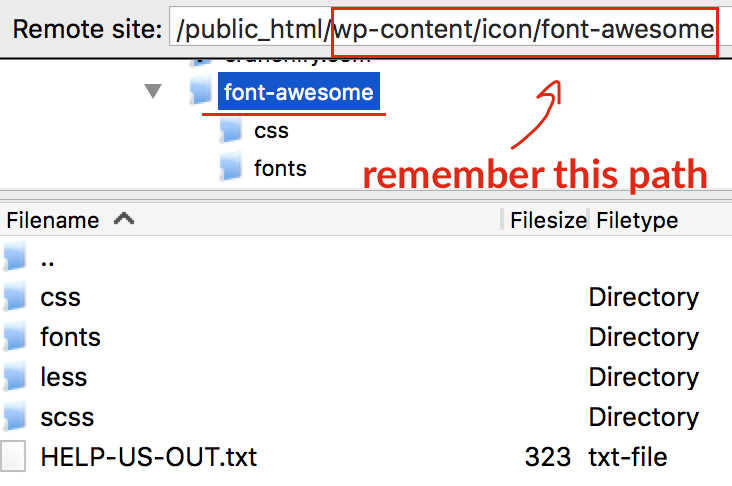 Extract it to your local drive and using FTP put it into a folder under /wp-content/icon folder. Go to your WordPress theme and enqueue font-awesome CSS to your theme. Just add below code to your theme’s functions.php file. Make sure now CSS loads on your site correctly. Now how to add Social Media and other icons into your WordPress theme? Let’s take social follow button example. You will be able to see nice Social Follow button on your site. You will have option to choose any icons from total ~630 fonts available out there. Let me know if you face any issue. If you are using MaxCDN then enable Allow Cross Origin Resource Sharing error.